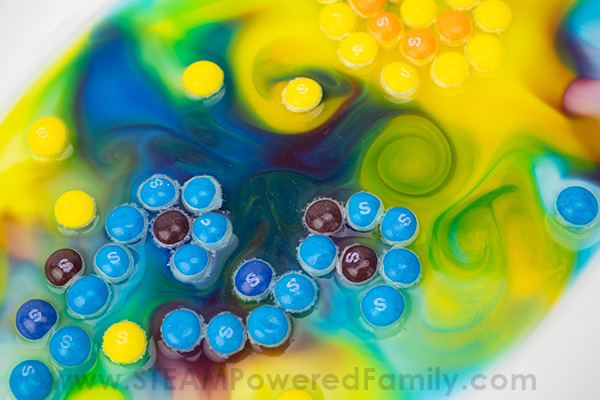 This Skittles experiment started out as a simple idea to play with some candy science on a quiet afternoon, but quickly it developed into this gorgeous exploration of colors and movement inspired by the artist Vincent van Gogh. 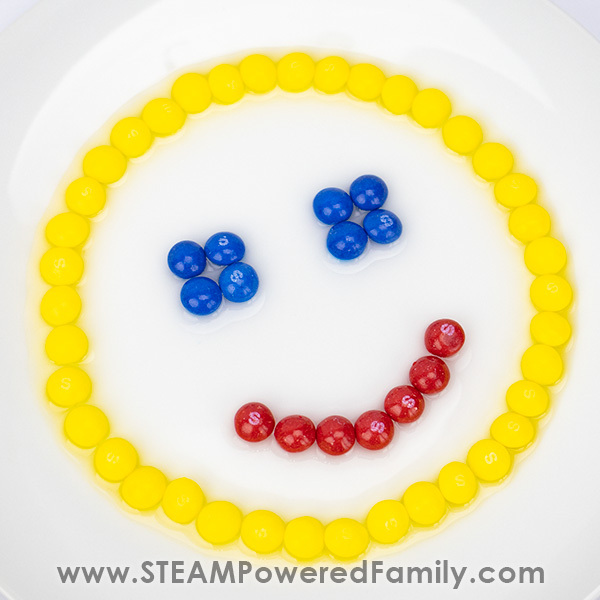 Who knew skittles and water could become such an amazing STEAM project? 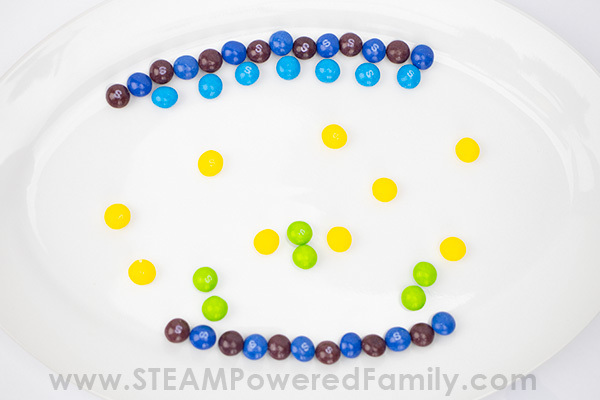 This is such an easy and fun experiment and a great idea if you want to do something a little unique with your Skittles for the science fair. All you need is some Skittles and water to create some serious wow moments. 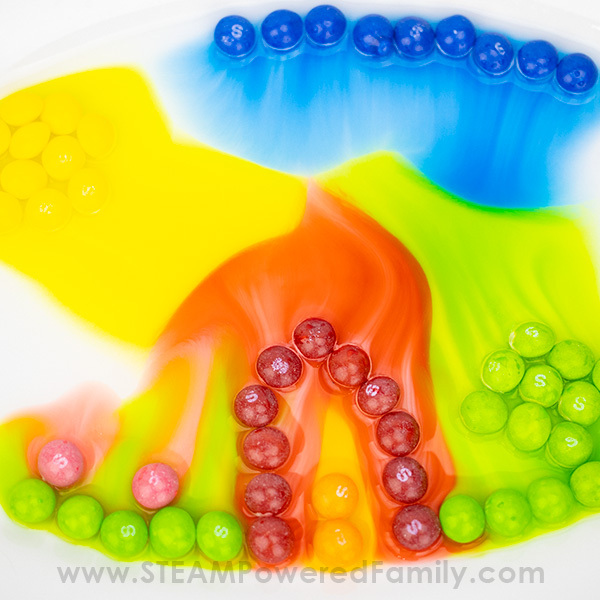 We started with a simple experiment where we made a ring around the outside of the plate with Skittles, added some water and watched the colors flow around the plate without mixing (unless we disturbed the water). 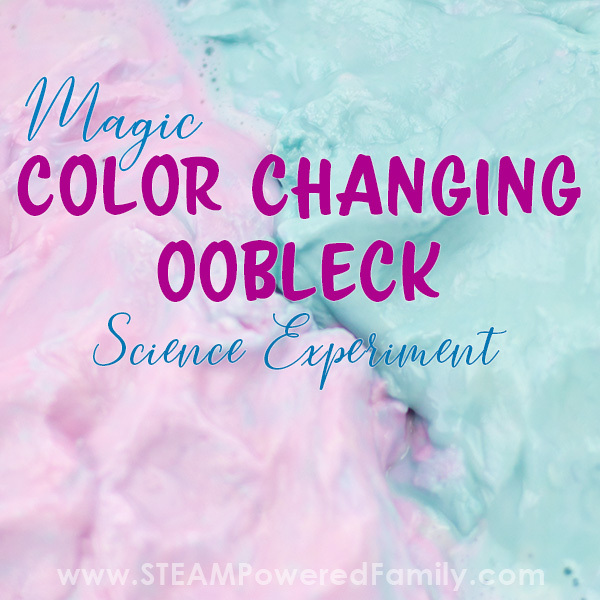 It was very pretty and happened very fast making this a great, quick, easy and budget friendly science experiment. Once we did the simple experiment, the kids had some questions and ideas. The most intriguing was, “Could we create pictures and art with Skittles science?” Turns out the answer is YES! Questions are a key part of the scientific method, along with observation and inquiry. So whenever we are doing experiments I encourage the kids to ask questions. To brainstorm and wonder. These are important skills we want to develop in our young scientists. You never know where a child’s simple question may take you in your lessons! 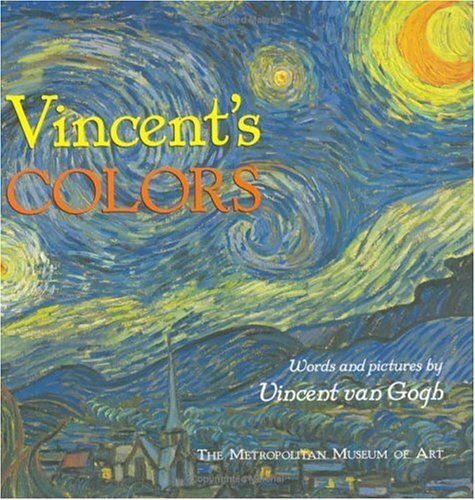 In this case we were able to combine an interest in science with our interest in van Gogh. So let’s step back for a moment and discuss the science that underlies everything we did here. The science behind why the colors do not mix is known as water stratification. 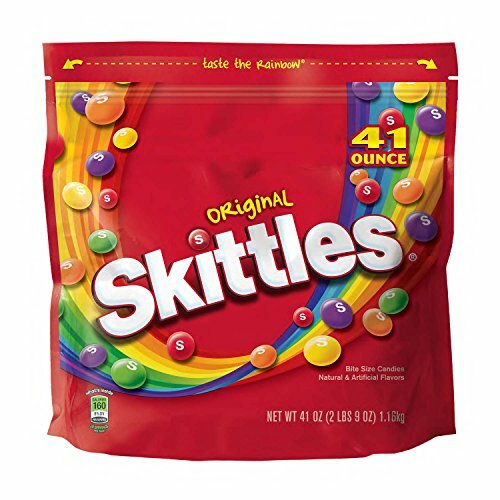 Each color of Skittle has a slightly different chemical make up which, when dissolved, creates a water solution that has slightly different properties such as density, salinity, and oxygenation. This creates a barrier that prevents the water from mixing and is why salt water and fresh water do not mix. Another scientific property that is at work here is called concentration gradient. Simply put this is the process where molecules will move from high concentration to lower concentration areas. We see this as the colors move through the water. We explored similar concepts in our Lollipop Layers experiment, another fun candy science project. Remember, part of this Skittles experiment to create art was being creative and imaginative! Prepare to do it a few times, creating new art each time. You will need a good sized white plate, lots of Skittles (snacking will happen! ), and water. Ensure you are set up in an area where the plate will not be disturbed. Any vibration or movement could affect your results. 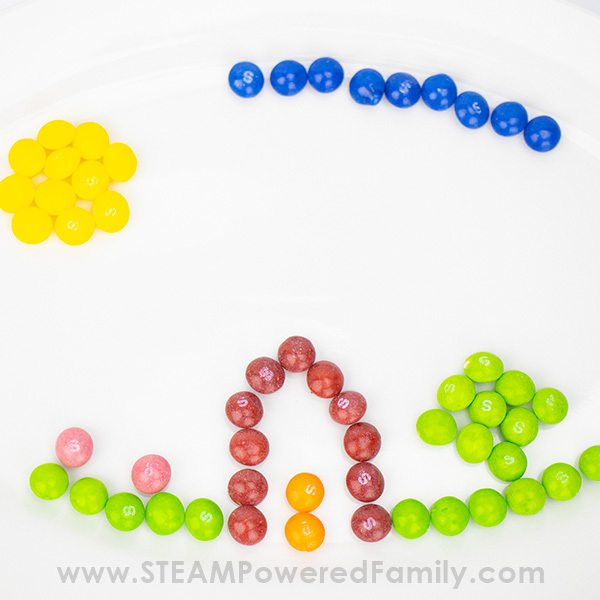 Consider what you want your art to look like and start arranging your Skittles in a pattern around the plate that you think will work best for your Skittles colorful art creation. Gently pour the water onto the plate. Very quickly you will start to see the colors travel. Watch to see how they move about the plate and what happens when they meet up with other colors. Depending on the size of your creation this will take about 10 minutes. Our favorite part of this experiment was creating a variety of different art pieces. We did a happy face, a house in a meadow under a sunny sky, the night sky with Northern lights, and finally our recreation of Starry Night. And after we added water to our Skittles. It didn’t quite turn out how we wanted, it is much more clown like than we intended, but we were on a role and ready to tackle more art projects! Our layout of Skittles candy for our art. Once we added our water it was like a fairy village came alive with all the magical colors! We get a lot of Northern Lights around here, so next we tried to replicate it. We started with a simple set up. Once we added the water it was like we had Northern Lights dancing across the sky filled with twinkling yellow starlight! For our big final piece we created was our Starry Night, made from Skittles and water. To create this piece we pulled up a picture of Starry Night and tried to replicate the position of the swirls and stars, plus the moon. When we added our water we noticed we didn’t get the swirls we were hoping for, but after applying the scientific method, doing some observations and critical thinking, we decided to try creating our swirls another way. We simply took a craft stick and gently pushed it through our Skittle colors. And it worked! We created wonderful swirls through the colors. We also spent some time doing research into Starry Night. 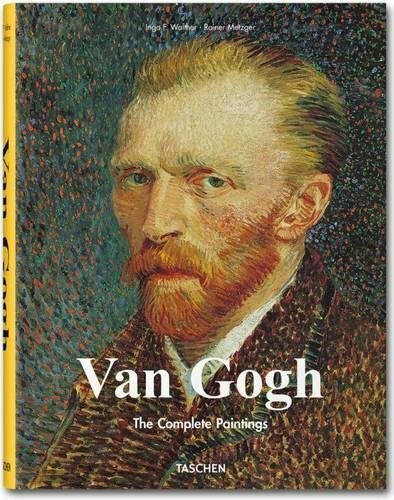 Did you know the swirls van Gogh created are mathematically perfect replications of “turbulent flow” in fluid dynamics? This is one of the most complex ideas to explain by mathematicians and physicists and wasn’t even explained scientifically until 60 years later when Andrey Kolmogorov proposed his model of turbulence. 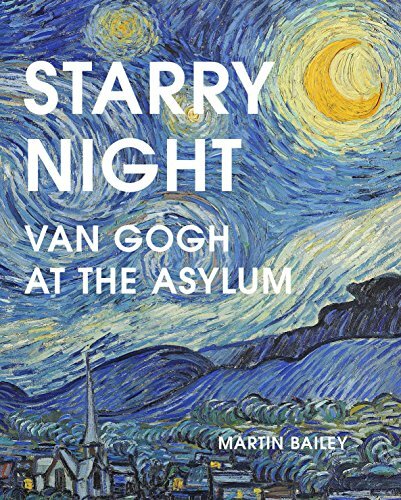 Starry Night was also painted by van Gogh while he was staying in a mental health asylum while struggling with such severe mental illness, he had recently cut off his own ear. This project became so much more than just creating pretty pictures with candy as we learned more about his struggles with mental health and the incredible understanding he had of natural phenomenon. He is truly one of the greatest STEAMists of our time. We really enjoyed this Ted-Ed video on the subject. Plus we were able to find a number of other books on the subject to help us with our research. Applying the scientific method is actually a very simple process that we do every time we do a science experiment. It becomes second nature to think like a scientist once you get the hang of it. 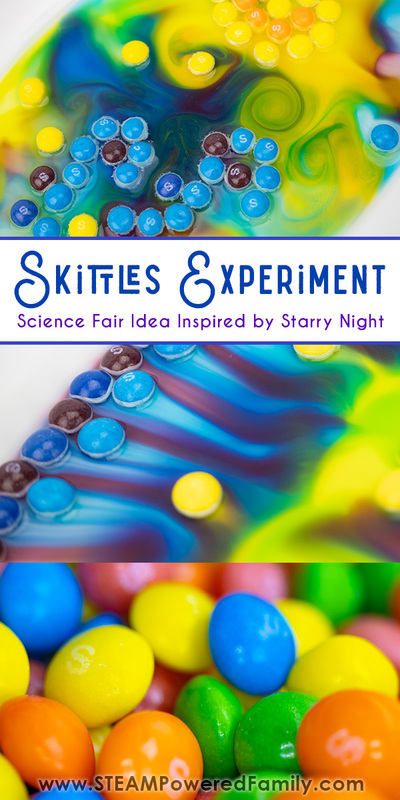 If you are doing this Skittles experiment as a science fair project, it might be your first time using the full methodology. So what is the Scientific Method and how do we apply it to this Skittles Experiment? This is where kids shine. All kids have lots of questions. 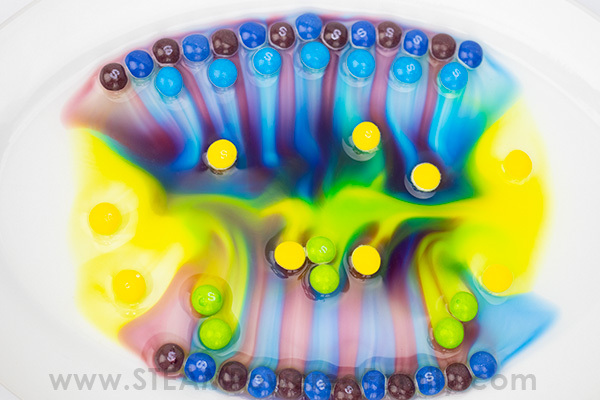 For this experiment our question was, “Can we create art and pictures with Skittles science?” Your question could be something completely different. 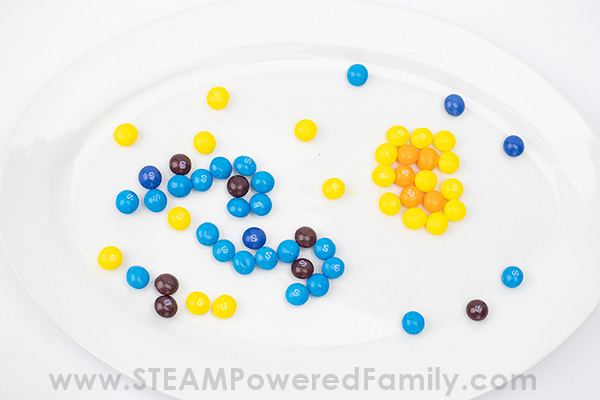 Maybe if it is your child’s first time doing Skittles Science they might ask, “Will the Skittles dissolve?” or “Will the colors mix?” Pick your question, it will be the driving force behind your science experiments. Now we do some research. Since we already knew the science behind Skittles experiments, we did a bit more research in stratification and concentration gradients. We also ran some small tests using Skittles and water. This was because we developed a second question that impacted how we would proceed in doing our experiment to answer our main question. The first question we had to answer was, “Would one color spread more than another?” Once we had that answer we were ready to tackle our big question. This is your prediction, based on research and perhaps some preliminary testing, on what the results will be of your experiment. We predicted we could make art with Skittles and water. Next we set out to do some testing. We set up our Skittles (on nice white plates), added some water and watched our art work take shape. This is where you can really fall down the rabbit hole of science! We did a number of tests. Where we carefully observed and evaluated the results of our Skittle art. We started with a happy face, then we created a house scene, then a sky. Each time we learned and tweaked our techniques. 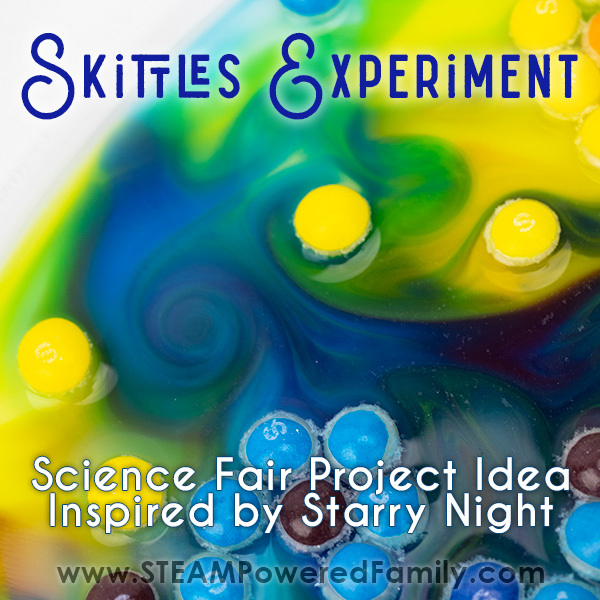 Until we were ready for our final experiment, seeing if we could create a Skittles experiment Starry Night! We analyzed the results to determine if our hypothesis was right, partially right, or completely wrong. Finally we shared the results. 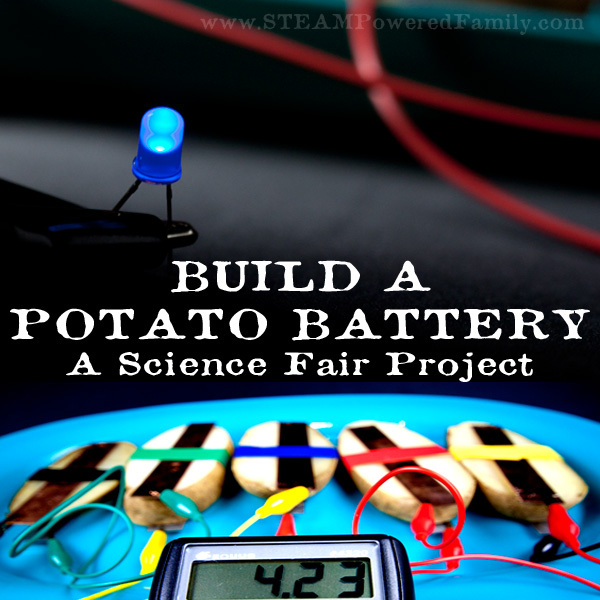 This could be done as part of a science fair board presentation, a video report, a written report, or an online article on your favorite educational blog! Your questions may be completely different. 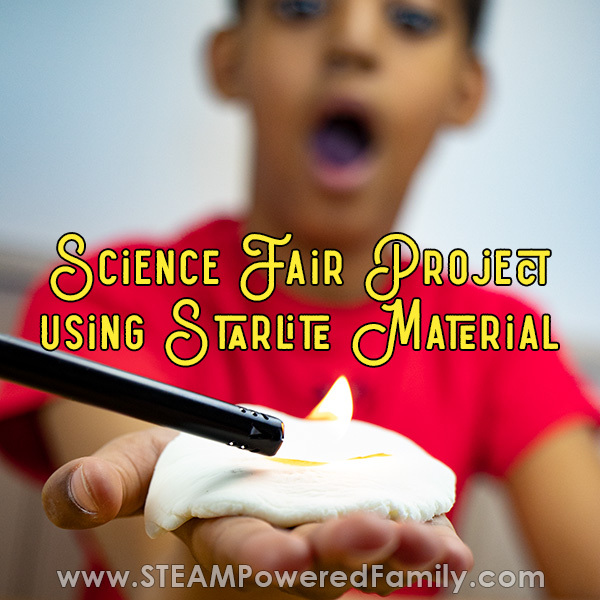 Here are some ideas for you to consider when coming up with your concept for the science fair. What happens if you use water at different temperatures? What happens if you use different types of liquids? Water, vinegar, juice, pop? 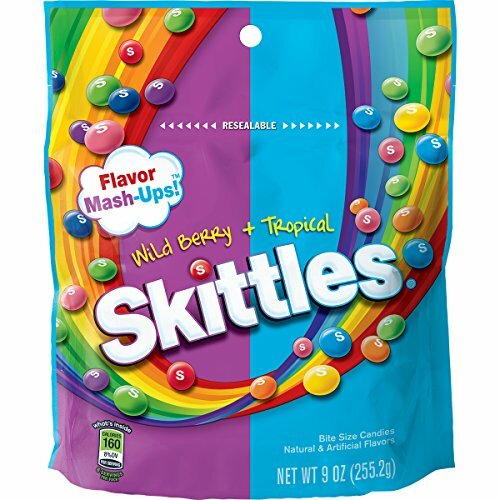 We used Skittles, but what would happen if you tried different candies? Lollipops, M&Ms, Starbursts, etc. When doing your science fair projects, don’t be afraid to think outside of the box and get creative. 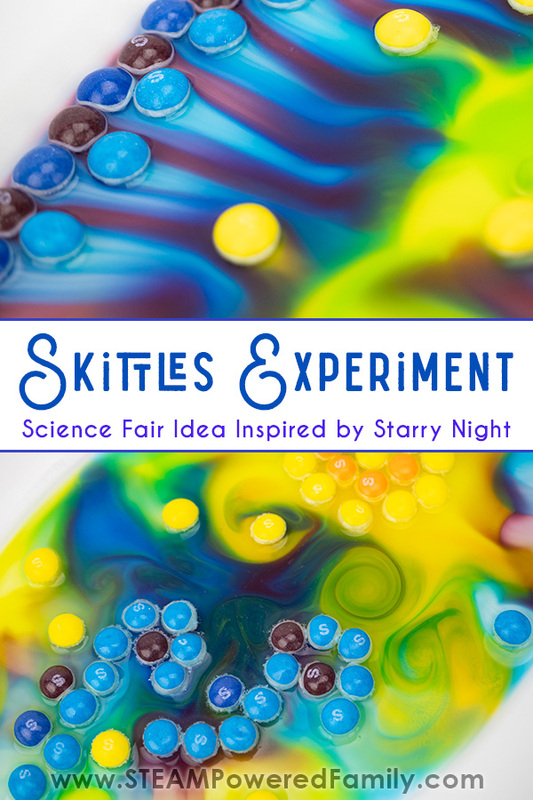 For the older kids tying in the science of Starry Night turns a simple Skittles and water experiment into an in-depth, fascinating study into a captivating artist and concepts that to this day still are the focus of work by mathematicians and physicists. 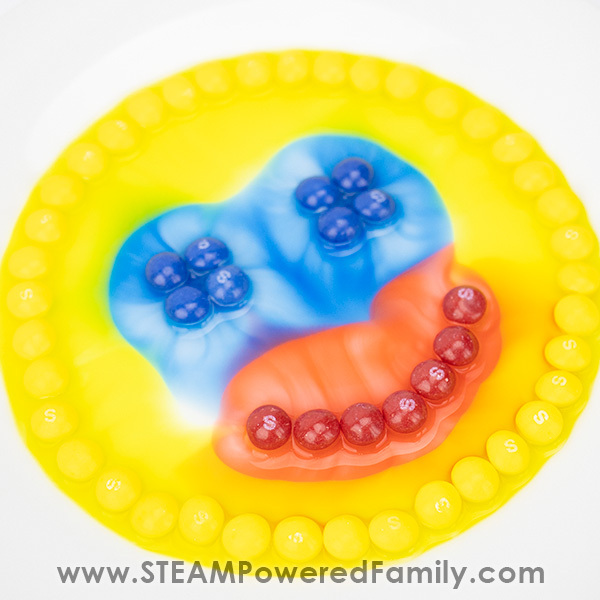 Have fun with your Skittles experiment creations! 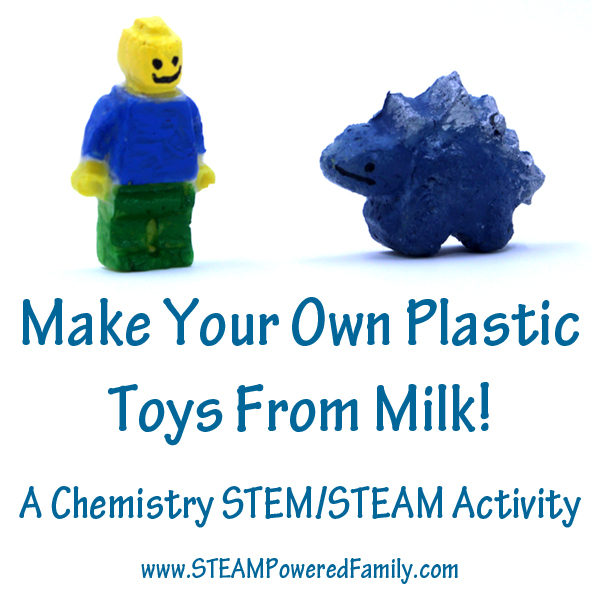 Join the STEAM Powered Family and get access to free educational resources. 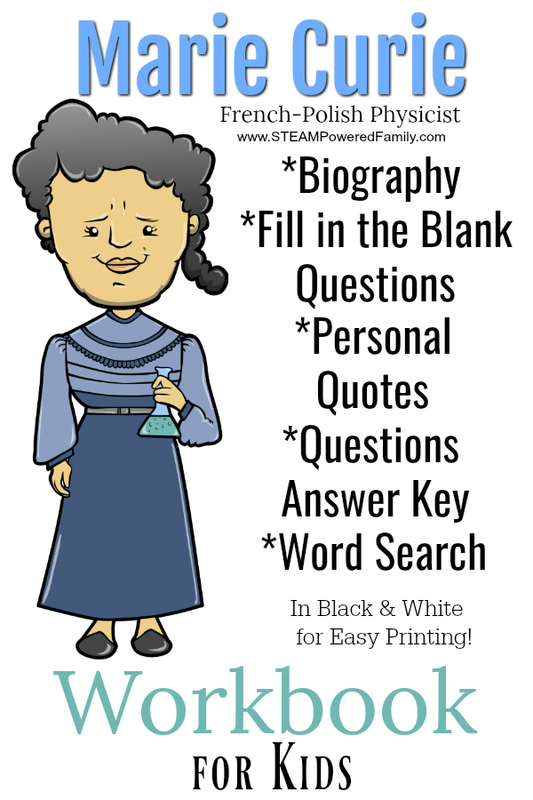 Get started right now with this Marie Curie workbook. Join now!